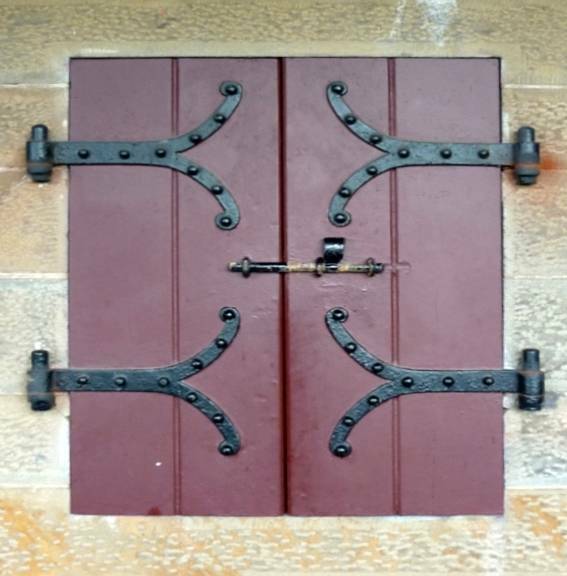 The silvered and foliated hinges here match the ones on the window shutters and are typical of Burges's more ornamental metalwork designs (contrast the shutters on the castle's outer walls. Burges had a particular interest in metalwork, "designing for Lord Bute an amazing range of silver plates, vessels and cutlery, rich in ornamental detail, which were produced by the most skilled silversmiths of the day" (Crowley 85). 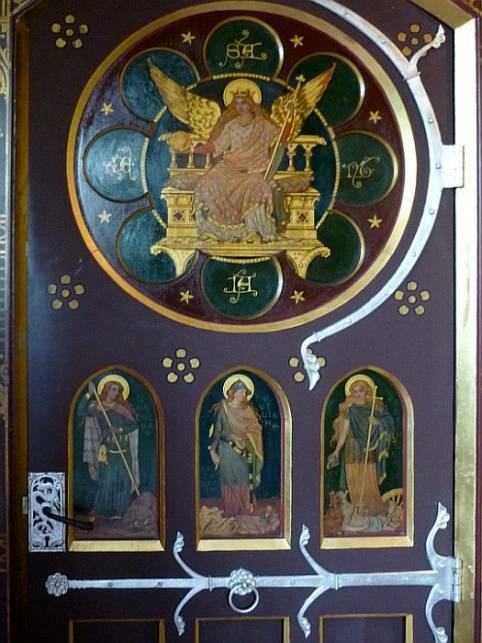 The painted panels on this door were executed for Burges by Frederick Weekes (1833-1920, the son of Henry Weekes), and demonstrate the Triumph of Virtue over the Vice. They complement the frieze of the Life of St Blane (patron saint of the Isle of Bute) on the walls of the room (see Crook, The Strange Genius of William Burges, 38). Burges's designs in various media were part of an integrated vision for any given room. Crowley, David. Introduction to Victorian Style. Royston: Eagle Editions, 1998. Crook, J. Mordaunt. William Burges and the High Victorian Dream. London: Murray, 1981. Cruickshank, Dan, ed. Sir Banister Fletcher's A History of Architecture (20th ed.). Oxford: Architectural Press, 1996. McLees, David. Castell Coch. Cardiff: Cadw (Crown Copyright), rev. ed. 2005. Newman, John, et al. Glamorgan (Buildings of Wales, Vol. 3). New Haven: Yale University Press, 1995. Williams, Matthew. William Burges, 1827-81. Andover, Hants: Jarrold Publishing (Pitkin Guide), 2007.